Money is pretty fickle, you know? What your dollar is worth changes daily, and there's always the distant chance that one day it won't be worth anything at all. One of the best ways is, of course, to buy gold. Unlike national currencies, gold as an intrinsic value to it that's held for thousands of years, and isn't likely to disappear any time soon. Did you know you can actually get paid for owning gold? That's double the cushion in your wallet! For thousands of years, human beings have worshiped at alters of gold. When it was first discovered, it was thought to be unique because of its bright color. Where most metals vary in shades of silver, gold stood out. And its unique properties have only really increased as we've found new uses for it. It's not just for pretty anymore; gold is an essential part of several industrial processes, including many of the chips that make your devices work. But gold's most important role today is as a store of labor. For thousands of years it's stood as a reward for doing something, a thing to be paid with. It's a currency, but a unique one in that it won't lose its value if a single country's economy falls. In fact, in times of crisis, gold becomes even more valuable. Not record numbers by a long shot, but you can clearly see the value that's been added throughout the first few months of 2017. When other economic indicators are uncertain, gold becomes the safe-haven investors want to pad their portfolios with. 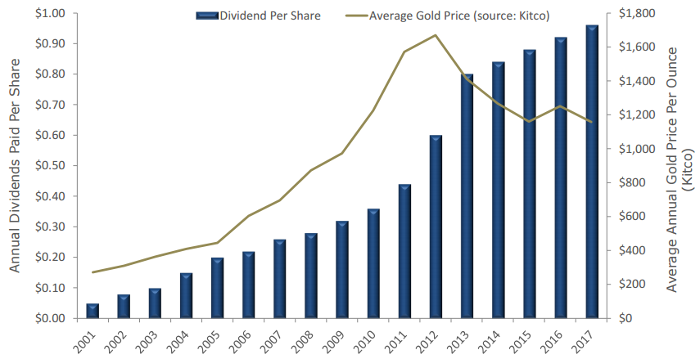 But what many don't consider is the actually incredibly easy way to get paid twice for buying into gold: gold dividends. Dividends are a big part of many investors' decision-making process. Long-term investors especially want to be sure they're getting the best yields from their stocks. Really, dividends mean you can get paid twice for any investment. And in the world of gold investments, it can be the ultimate bonus payment. What's more, it's not necessary to buy and hold a stock for years to get that extra payout. Ever heard of ex-dividend dates? It's pretty much what it sounds like: a date after which a new investor will not be able to claim a dividend. The day the company announces the dividend. The day before which you must own the stock in order to receive that dividend. If a stock is bought on or after this date, the stockholder doesn't get paid. The date, usually two business days after the ex-dividend date, that the company records who will be getting the dividend. The day the dividend gets paid out. It can be easy even for short sellers to get a single dividend out of a stock. So long as they've bought the stock before the ex-dividend date and not sold it until that day or some time after, they get the dividend. However, this also offers a deal for longer-term investors: usually, since the stock trades without the announced dividend on the ex-dividend date, the stock price drops by that amount. It could be a very small discount depending upon the payout, but it could also be worth it, especially if one plans to hold on to the stock until the next dividend. Well, that's more value in your portfolio — and money in your pocket — than you may have seen at first glance. And who doesn't want a little extra income when they can get it? One day, we're going to run out of gold puns. But we'll still have our dividend stocks in hand. For those looking to play on either side of the ex-dividend date, it's as simple as watching for it on a company's announcement. Usually, the company will put out a press release stating that a dividend will be paid on a certain date, “to stockholders of record at close of business [ex-dividend date].” Terms vary, but the date is still made abundantly clear. And for those who simply want to get paid a little extra for holding onto one of the world's longest-lasting value commodities, here are a few of today's highest-yielding gold companies to take a look at. Nevsun Resources (NYSE: NSU) isn't a pure gold play. The company produces copper and zinc in addition to our favorite precious metal. Currently, it's operating and expanding its gold and copper Timok Project in Serbia. The mine is within range of existing industrial infrastructures, and has an inferred mineral resources of 35 million tonnes with an average grade between 1.7 and 10.4 grams of gold per ton of rock in the area. The company pays quarterly, and the dividend has stood steady at $0.04 per quarter since the end of 2014. That accounts for a yield of 6.3%. For a more gold-concentrated stock, there's Randgold Resources Ltd. (NASDAQ: GOLD). The company operates in the golden sweet spot of West Africa, as well as in areas of Central Africa. As of the fourth quarter of 2016, Rangold had produced just under 378,388 oz of gold, up 26% from the quarter previous. 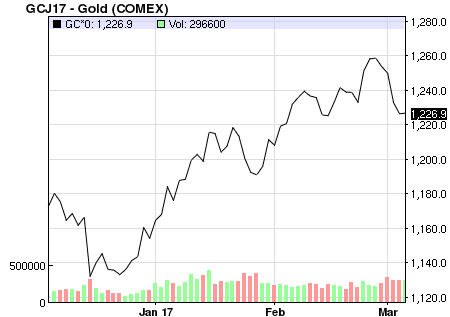 Because of the rise in prices you saw in the chart above, plus the company's increased prdouction, Randgold's annual profits rose 38%! And so it's no wonder that in the same quarter, the company approved a 52% increase in its annual dividend to a record $1.00 per share, for a yield of 1.1%. And finally, there's Royal Gold Inc (NASDAQ: RGLD), another mainly gold play. Gold is in the company name, after all. However, it also keeps reserve and production numbers on the books for silver, copper, lead, zinc, nickel, cobalt, and molybdenum. Most of the company's revenue derives from just eight principal properties in Chile, the U.S., Canada, Mexico, Dominican Republic, and Ghana. Two more major projects are in development in Canada and on the Chile-Argentina border. Right now, Royal Gold's yield stands at 1.4% for $0.25/share per quarter. And remember: you can buy in low and hold onto these valuable stocks — which will continue to pay you back for it all the while — or you can take advantage of the ex-dividend date and make a little extra very quickly. Either way, it can't hurt to have a bit of gold in your portfolio and a bit of profit in your pocket.